In thoughts, deeds, character, and intentions, it is only a wise person who can benefit himself as well as others. It is only a devotee that can be selfless and dedicated to others. For a devotee, there is no variance, all is one and one is all. Wisdom comes with devotion and devotion is yielded from surrendering. 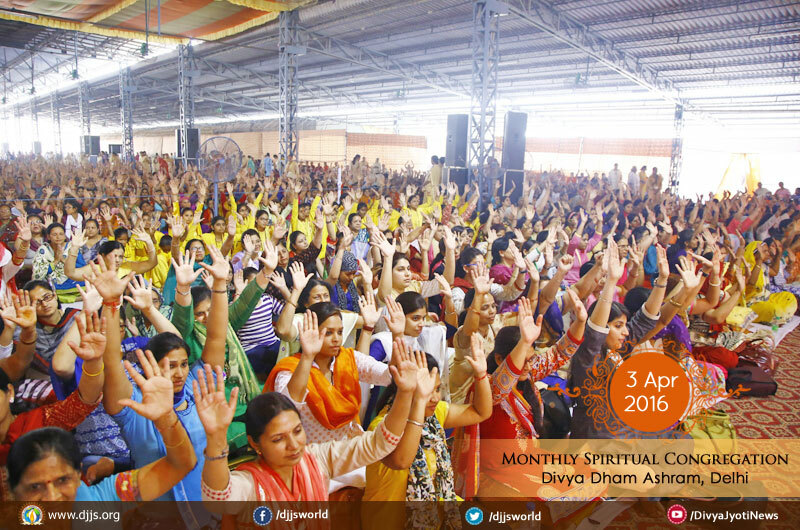 Such were the resonating words of wisdom flowing incessantly throughout Divya Dham Ashram, Punjab Khor, New Delhi on April 3rd, 2016 at the monthly majestic mass known as the Bhandara program. Countless devotees attended the program and felt rejuvenated from the divine vibes reverberated through the enlightening sermon and devotional tunes. The vibrant stage set up through which precious discourse and the melodies disseminated supplemented the divine ambience. To bring change in the world we need no more worldly revolutions, but inner evolution. Change in the inner chambers of the hearts of each individual must occur in order to see the change outside in today’s distressing world. Such a change is possible through the precise technique of Brahm Gyan, a scientific method to achieve peace. The worshippers were seen dwelling in the harmonious hymns as well as embedding the spiritual guidance into their hearts. All assertions touched hearts at the individual level bringing out emotions and providing clarity to wandering minds. Attendees anticipate for this event month-long and aspire to deepen their roots transcendentally between programs. The monthly event serves as a clarion call to generate progress on the path that Satguru trends forth for a disciple. The program came to a close as it illuminated the dark minds, brought rest to the drifting zeal, and sprung up the reposing souls.